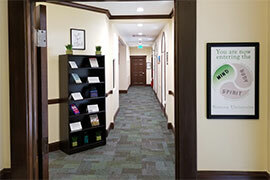 Student Counseling Services, located at Griffith Hall on Stetson’s DeLand campus, is broadening its reach and impact. Last October, Student Counseling Services (SCS) moved into newly renovated Griffith Hall to share space with Stetson Health Service and Religious & Spiritual Life, as part of a refocused holistic approach to wellness for the mind, body and spirit. Now, SCS is broadening its reach and impact. As classes for the Fall Semester began Aug. 23, Kognito At-Risk On Campus has become accessible on MyStetson, delivering greater access to suicide prevention and mental health training across the university’s DeLand campus. In addition, SCS has introduced WellConnect, a counselor-on-call system that provides outside afterhours support for mental health crises in DeLand and at Stetson University College of Law in Gulfport. “We are rolling out new programing [WellConnect] and simultaneously promoting programing that has been underutilized on campus[Kognito]. Both are related to suicide prevention and mental health education,” said Leigh Baker, Ph.D., director of Student Counseling Services and a licensed psychologist. Those two crisis-response services — available to students as well as faculty and staff — complement numerous services at the center, which include individual, couples and group counseling for students; consultation; and outreach programming. Kognito At-Risk On Campus is an interactive online simulation that prepares users — students, faculty and staff — to recognize signs of psychological distress such as suicidal ideation, depression, anxiety and substance abuse. Adopted by more than 350 universities and colleges nationwide, the approximately 40-minute course helps users practice crisis-related conversations in an avatar web-based setting. Since 2012, Stetson has used Kognito but only upon request and on a limited basis. Now, new accessibility on MyStetson puts the course just a few clicks away. Go to the Student Life tab; then Mind, Body and Spirit. Select Kognito At Risk for Students Suicide Prevention Training. This links to stetson.kognito.com; sign in using your Stetson login. Reset your name by clicking on the 800 number in the right corner. 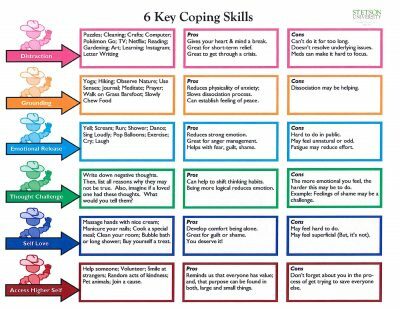 The interactive role-play simulation for students builds awareness, knowledge and skills about mental health and suicide prevention, preparing users to lead real-life conversations with fellow students in distress and connect them with support. Under the My Job tab, click on Kognito At Risk for Faculty and Staff Suicide Prevention Training. 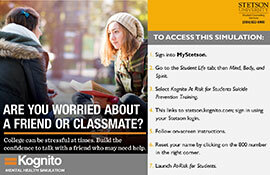 Sign into Kognito with your Stetson University account. Users will receive a Certificate of Completion, and the course may be repeated to refresh skills or recertify in the program. “To take the course, all you need is an internet connection. If you’re short on time, Kognito saves your progress along the way, so you can complete it in multiple settings,” Baker noted. 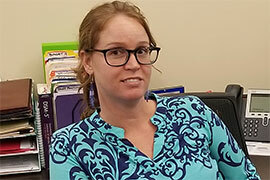 The introduction of the WellConnectcounselor-on-call system provides outside afterhours support for mental health crises at both the DeLand campus and Stetson University College of Law in Gulfport. The system brings greater continuity of services during crises, as well as a direct point of contact to SCS — with the service establishing full 24-hour support and consultation for students on the campuses. WellConnect is available by dialing 386-822-8900 (the same number as Student Counseling Services on the DeLand campus) and following prompts, or calling 833-848-1765. In the past, staff clinicians at SCS provided around-the-clock support with afterhours covered on a weekly alternating basis — outside the hours of 8 a.m. to noon and 1 to 4:30 p.m., Monday through Friday. Afterhours calls initially went to Stetson’s Office of Public Safety and then were forwarded to Stetson staff clinicians. Now, WellConnect provides an immediate first contact during afterhours, backed up by Stetson on-call staff support, which will remain in effect. Residential Living and Learning, W.O.R.L.D. (World Outreach, Research, Learning and Development): The David and Leighan Rinker Center, and the College of Law collaborated with SCS to bring WellConnect to the Stetson community. Lynn Schoenberg, dean of students on the DeLand campus, agreed. “I truly believe WellConnect will increase access to services for our students while simultaneously allowing our counselors to work deeper on suicide prevention and outreach,” Schoenberg said. “We are really excited to be able to extend the availability and accessibility of counseling at Stetson for any of our students who need to talk to a counselor outside of business hours,” said Correll-Hughes, also assistant vice president for Campus Life and Student Success. Promoting the wellness, personal growth and academic success of students is a community effort, Baker concluded.